Version 1.0 has been written from scratch using OOP. The code has been structured better, the functions have been marked and commented and everything is better integrated with Wordpress API. This plugin works with Qtranslate since 2.5.8.
works with any permalink combination and qtranslate mode. new branch, the plugin has been rewritten: now the code is commented and wrapped inside a class, much code has change and the performance has been increased (use caches). data system changed, no ID for slug type, then it don't needs install qtrasnlate_slug table. That means slugs now are stored on meta tables and installation creates a termmeta table with some new core functions to access/save data, based on simple term meta. Upgrade process when the plugin updates from older versions. the plugin generates translated slug automatically from title in empty cases. the plugin checks if the slug already exists (per each language and post_type/taxonomy), and adds a progressive number in this case. 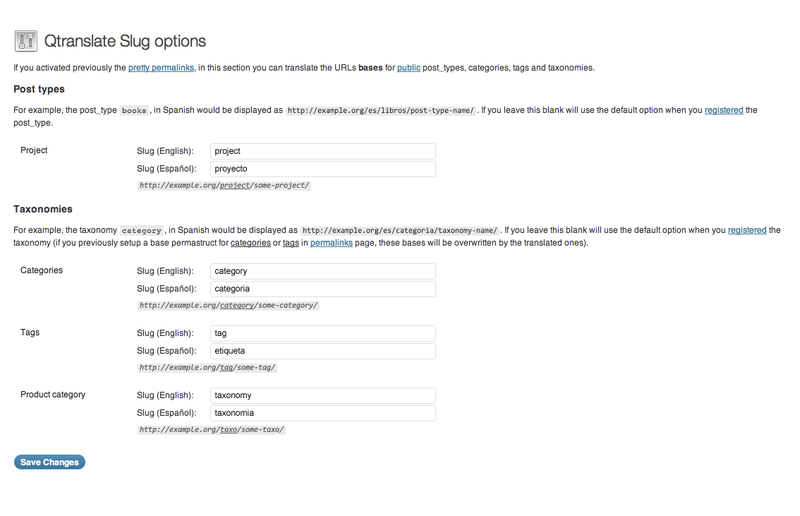 Works on ajax requests for example when new taxonomies are created in edit post page. possibility to translate the base of permastructs for post_types and taxonomies, uses $wp_rewrite. New admin options page for save the base permastructs. added some filters, see in other notes. added plugin language textdomain (.pot file). 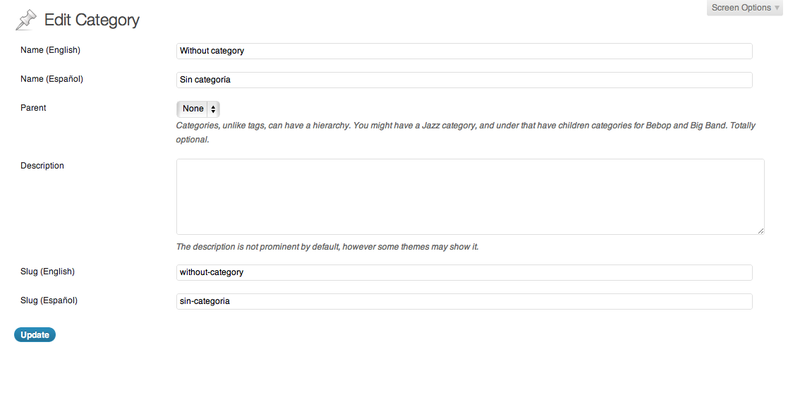 updated Language selector Widget, and some new conventions like accessible functions for templating. You can also check the project website hosted on GitHub. Thanks for use this plugin! This plugins requires Qtranslate installed previously, if not, it will not activate. 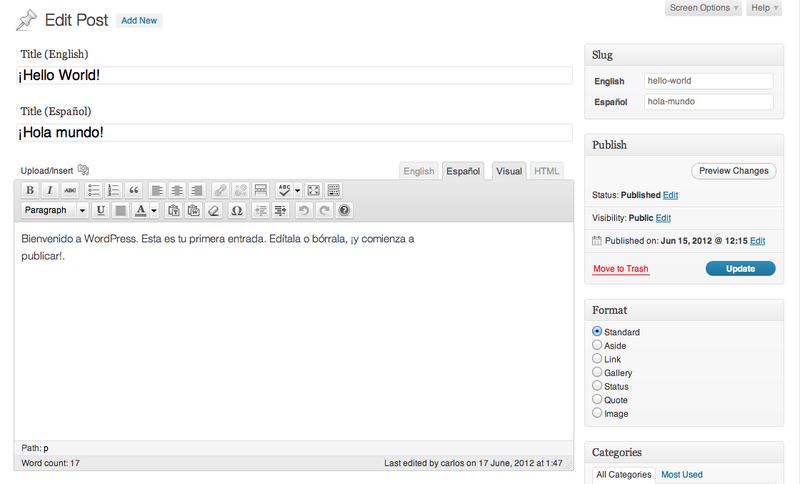 Upload qtranslate-slug to the /wp-content/plugins/ directory. In admin: navigate to Settings/Slug options. Set the base permastructs for post types and taxonomies (If you setup a base permastruct for categories or tags in Settings/Permalinks, these will be overwritten by the translated ones). Save settings and that's all! It works with posts and pages, but with other content type? 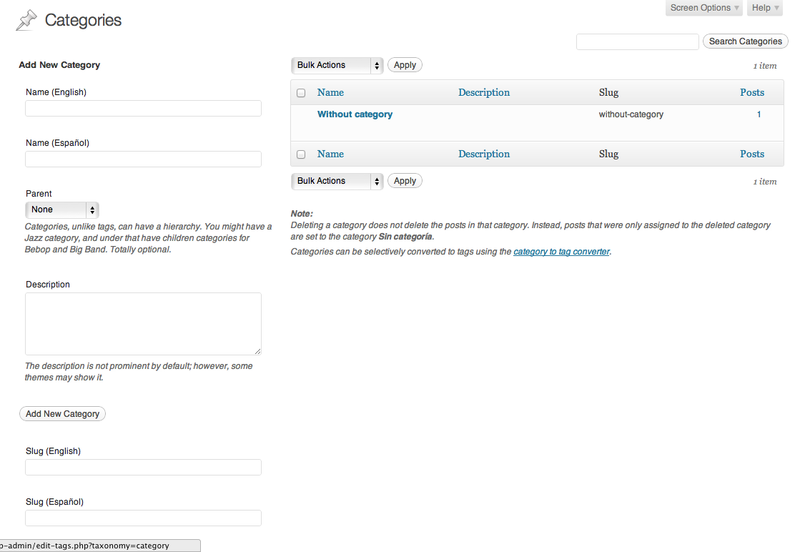 This plugin allows to translate slugs of: posts, pages, custom post types, categories, tags and custom taxonomies. How can i insert a language selector in my theme ? use Qtranslate Slug Widget in your sidebar. place in your template <?php if (function_exists('qts_language_menu') ) qts_language_menu('text'); ?>. Options are: dropdown, text, image, and both. Appears an error 404, what can i do? In the admin go to Settings/Permalinks or Settings/Slug options and save. I can't manage translations in Nav Menus. That's because language selector metabox is hidden, if you are in admin nav menus screen, press the button Screen options (on top and right) and after, check the option Languages. It will appear a Language meta box on top of the left sidebar. Major version, the plugin has been rewritten. Better performance, and some enhancements. This version fix some bugs and allow multilanguage in nav-menus. filter to process the post slug before is saved on the database. filter to process the term slug before is saved on the database. filter to process the entire url after it has been generated. filter to process the permastruct, used for change the base. translate other slugs like attachments. multisite: add suport as network plugin enhancing the request, some qtranslate patches. qtranslate integration with other plugins like Jigoshop, e-commerce, etc. Addapt $wp_rewrite.